Domesday does not mention a church or a priest in Bubwith, whereas churches were noted at both nearby Holme and Wressell. This does not necessarily mean that there was no church, just that it did not figure in the returns of land ownership. It is not known with any degree of certainty when a church was first built in Bubwith. The earliest reference found so far to a rector of Bubwith is in Clay's York Minster Fasti, where he gives William de Winchester, between the years 1138 and 1143 as a canon of York and rector of Bubwith. The evidence for the split of the rectory of Bubwith into two moieties is lacking. We do know that it was in two moieties by 1138-1143, as at this time Warin de Bubwith, a tenant of William Tison, gave one of the moieties to St. Peter's York (the Dean and Chapter of York Minster) together with a carucate there, to safeguard the tenure of William of Winchester, canon of York. This gift was confirmed by Roger de Mowbray, stating that the church was founded on land held of him by Warin, and also confirmed by William Tison stating that it was founded in his fee. Regarding the other moiety we also know that in the period 1148-1153 archbishop Henry confirmed the gift of made by Eustace FitzJohn to William of Winchester of a moiety of Bubwith church founded in Eustace's fee, Eustace being a tenant under the Mortemer fee. The church continued in moieties for several centuries, with one being in the hands of the Dean and Chapter of York throughout, and the other passing through the de Vescy family (William de Vescy, the first of this line, was the son of Eustace FitzJohn). Eventually this moiety was given by John de Mowbray to the Abbey of Byland in 1349, and upon the dissolution this moiety came into lay hands. 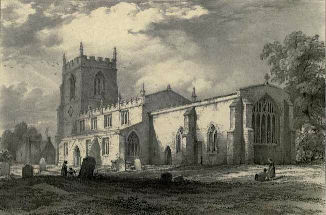 "Quite a large church, at the end of the village and open towards a loop of the river Derwent. The church has a Norman chancel arch, with triple responds, mostly scallop capitals, and an arch of many mouldings. Hoodmould with lobes. * Of this original Norman church there is also (now inside the N aisle) one flat buttress and a length of corbel-table. The W foundations of the building have been found too. The church received aisles in the C13, but they were only of three bays. They have round piers, octagonal abaci, and double-chamfered arches. The responds are keeled. When the Perp W tower was built - a handsome piece, all ashlar, with deeply set windows, battlements, and eight pinnacles - the nave was lengthened to the W by one more bay. This has octagonal piers, and it is interesting to note that the capitals are copies of those of the C13. Only the bases are Perp. Tall Perp tower arch, Perp clerestory with battlements and pinnacles, Perp five-light chancel E window. However, the chancel side windows have tracery of c.1300 (cf. Howden). - FONT. Octagonal, inscribed fons de bubvid. PEWS. Good jacobean fronts. - SCULPTURE. In the S aisle (W) a Norman capital with an interesting basketwork pattern. - (More Norman fragments are built into the chancel walls. - Above the chancel arch, on the E side, a small winged figure in relief, on an elongated quatrefoil; c.1200? JH) - Funeral HELM and SWORD (NE corner). - STAINED GLASS. In the E window C15 fragments including the tops of two canopies. - Other medieval fragments in two windows in the N wall, one N clerestory window, and in the upper tracery of the S aisle E window (B. Johnson). - PLATE. Cup, London, 1631; Paten, London 1691; Paten, London, 1708, by John Rand. * Mr Hutchinson adds the following: The E wall of the nave is set back over the arch, and above this can be traced the complete Norman gable-end in diagonally tooled masonry enclosing l. and r. rectangular openings, apparently original though now blocked. Moreover, outside, in a corresponding position on the E nave gable to the N of the chancel roof, there is what appears to be the head of a small Norman window - cf. the similar arrangment at Huggate, though here there is no doubt about the features being original." The Buildings of England, Yorkshire: Yorks and the East Riding, 1972, Nokolaus Pevsner, with contributions from John Hutchinson. 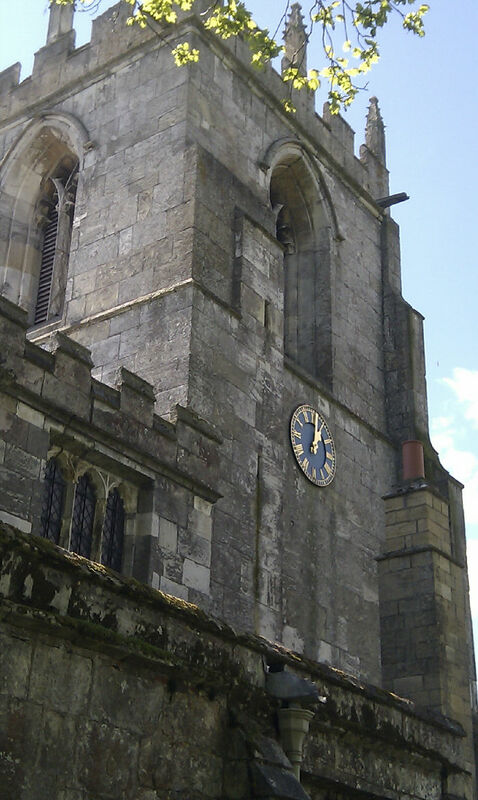 The tower of the church was built by Nicholas Bubwith, one of Bubwith's famous sons, who became Lord Privy Seal (1405-6), then successively Bishop of London (1406), Bishop of Salisbury (June 1407), Lord High Treasurer (1407-1408), and Bishop of Baths and Wells (Oct 1407 - until his death in 1424). During the Commonwealth Survey held at Beverley on the 25 November 1651, it was reported by the Commissioners that Spaldington and Willitoft have two chapels within the parish, and Gribthorpe is within half a mile of the same and therefore fitt to be united. Willitoft is in the midst of them and therefore fitt to be made the parish church. Needless to say, that this recommendation was not acted upon. Silver : Communion Cup, two Patens or Salvers, and Flagon. The cup has a conical bell-shaped bowl with a moulded baluster stem and plain circular foot. It is inscribed, on the foot : "Welham Bridge Chapel." Height 8, dia. of lip 4.25, of foot 3.5, depth of bowl 4 in. Hall-marks: (1) sm. italic O; (2) l.p.; (3) l.h.c. ; (4) R A, with a fleur-de-lys or cinquefoil below (London, 1631). The first paten is a plate on a central circular stem and foot. It has the sacred monogram in a glory at its centre, and the inscription : "Welham Bridge Chapel." Dia. 9.25, that of foot 3.75, height 2 in. Hall-marks : (1) doubtful, perhaps I C, with a cinquefoil below; (2) l.h.c. ; (3) l.p.; (4) sm. Old Eng. O (London, 1691). The other paten is also a vessel with foot and stem. A shield of arms at the centre displays : A fesse between 3 fleurs- -de-lys, impaling Checquy or and gules. Dia. 8.75, of foot 4, height 2.75 in. Hall-marks: (1) R A, in shaped shield; (2) Brit. ; (3) li.hd.er. ; (4) Court hand N (London, 1708, John Rand, entered 1706). The flagon is a tall peg tankard, and is not an English vessel. It has a domed cover with a thumb-piece formed by a winged cherub. The barrel is chased all over with a scroll ornament, and on the inside four pegs divide the contents of the vessel into five equal parts. At the centre of the cover the letters I H S, in monogram, have been engraved, surrounding which are the words: " KIERSTEN IACOBS DATTER SOLI DEO GLORIA 1640 HINRICK HOE." (see note) The height is 8.5, the dia. at top 4, and that of the base 5 in. There is only one doubtful silver mark on the bottom, something like a W.
The pewter flagons are alike, being plain tall tankards with covers and thumb-pieces, but no lips. Each is inscribed "Bubwith Church Flaggon Anno Dom. 1720" ; and the dimensions of each are 11 high, 4.5 dia. at top, that of base 5.5 in. There are no pewterer's marks. Note: This is Danish or Norwegian, and Henry Hoe, for which to God be all the appears to indicate that Christian, glory. Jacob's daughter, married, in 1640, to Henry Hoe, for which to God be all the glory. The clock was presented to the church by Mr Robert Chaplin in memory of his father Mr Robert Schoolcroft Chaplin of Menthorpe who died on the 1st June 1909. The clock was dedicated on the 19th July 1910, so was installed between these dates. However, no Faculty for its installation has yet been found. The clock has faces on the north and south sides of the tower, and the clock face on the south side replaced an earlier sundial set in a lozenge (as can be seen in the painting used as the banner image at the top of the webpage), but the fate of the sundial after its removal is currently unknown. The clock was made by G.J.F. Newey of York. Directories of the latter half of the nineteenth century describe All Saints Church has having three bells. Currently the tower boasts 5 bells. 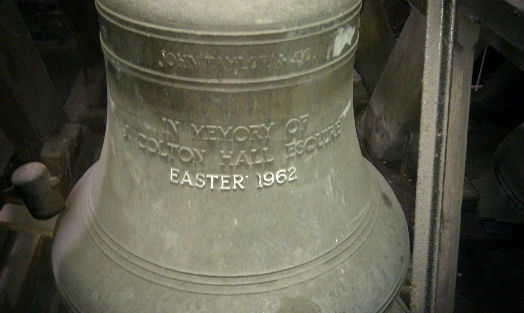 Bell 5 is 35.25 inches, Note A, and is the youngest bell, dating from 1962, but installed in Bubwith Church in 1994. 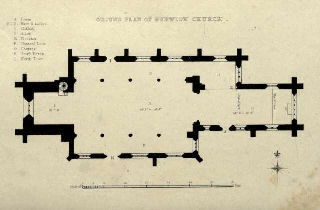 It was previously in St. George's Church, Swallowbeck, Lincoln. 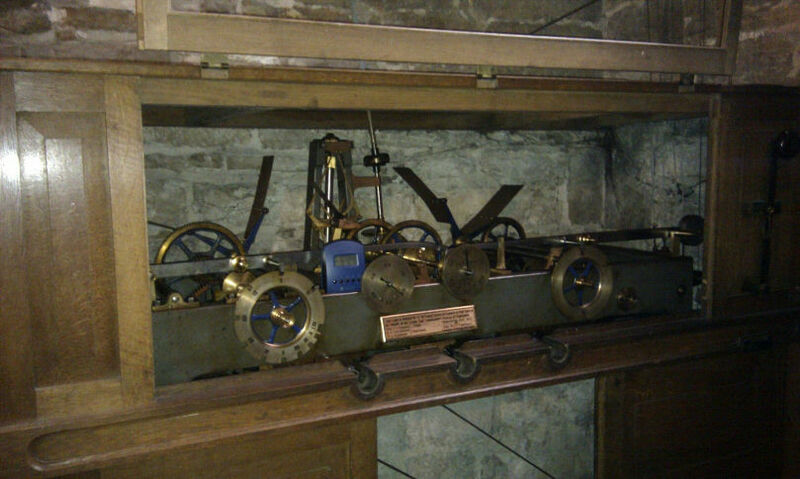 Bells 1, 2, 3 and 5 are also used for the chiming of the clock.